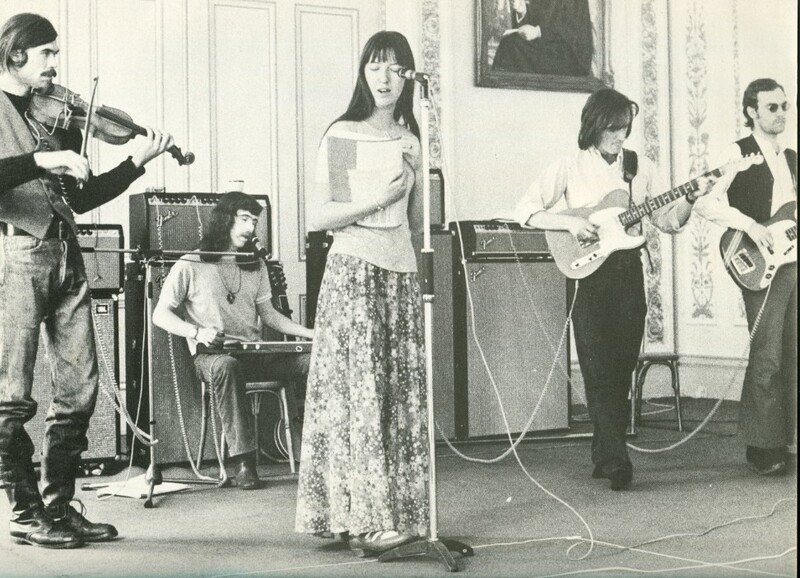 During the early 1970's Steeleye was a regular visitor to BBC studios to record live sessions. The band was a favourite of John Peel and featured heavily on the programmes 'Sounds of the 70's' and 'Top Gear' with various presenters. However, the exact details of many of these sessions are often confusing. It would seem likely that a majority of the original recordings have been lost, with many seemingly only surviving as 'Off Air' recordings. The 2003 Castle/Sanctuary re-issues of 'Please To See The King' and Ten Map Mop' apparently used these ‘Off Air’ sources, but are not complete and contain errors. It is almost impossible to piece together exactly all the radio sessions Steeleye took part in and the songs/tunes that they played. But fortunately help is at hand. After many years of research Chris Haines has compiled the most detailed information available for these BBC Sessions that can be found anywhere and has been kind enough to share his research, which is contained below. I'm sure he would love to know if anyone has any more information/recordings. Contact him via the website. Enjoy! Recorded at the same time as the sessions for Hark! The Village Wait and showcasing songs from the LP, this has now been reportedly lost according to The Journey CD liner notes. Rehearsals in May with new members Martin Carthy and Pete Knight, led to the first recorded appearance of the new line-up for the BBC. Three of these tracks would appear on the next LP Please To See The King; however, The Blacksmith appears here with a more upbeat arrangement, whilst Female Drummer begins with Tim's strummed Dulcimer intro. Rave On would be released as a single over a year later, but I Was A Young Man would not appear officially except in a version recorded by Martin Carthy for his Shearwater LP in 1972. One of the few early sessions the BBC have still got, hence its many repeats (which are in better quality). 2.1 and 2.3 can also be found on BBC Transcription Disc No 296. The Group's first live appearance at Cambridge Folk Festival in July was marked with this BBC session of material almost certainly from their repertoire at the time. Another three songs that would appear on Please To See The King, with the Bold Poachers (here sung by Martin) not being recorded officially until the Parcel Of Rogues LP three years later. On the eve of the group's first Autumn tour, a 'live-in-the-studio' session featuring the only appearances of Lovely On The Water and Wee Weaver (later to appear on Ten Man Mop). The PTSTK re-issue replicates the session sheet order, but the above is as broadcast. Track 4 fades down unnecessarily and Lovely On The Water is omitted. The 'Reel' listed as CD2 Track 7 is not part of this session. 4.3 and 4.5 also available on Ashley Hutchings' The Guv'nor Vol1. Recording sessions for Please To See The King continued into January when the group found the time to record this session. Includes the otherwise unrecorded Farther Along. 5.1 listed as 'Reel' appears to be a relation of Silver Spear/College Grove from the previous session. Track 7 is wrongly dated on the PTSTK re-issue and belongs to this session [see above]. Also Track 11 dates to the following session. Taking advantage of a break from supporting Jethro Tull on their Aqualung UK Tour, the group recorded, amongst other trad. songs, a cover of Chris Montez' Let's Dance (an interest in rock n' roll already indicated by last year's Rave On). 6.4 was included in the Corunna play performed in May and June and was not recorded elsewhere. 6.1 listed as 'Two Reels' seems to be Dowd's Favourite/£10 Float later recorded for Ten Man Mop. 6.3 Prince Charlie Stuart's second appearance is preserved off-air. The PTSTK re-issue wrongly dates Track 11 - which belongs to this session and also Track 14 (Lark In The Morning) which doesn't and comes from the ATV Music Room performance. 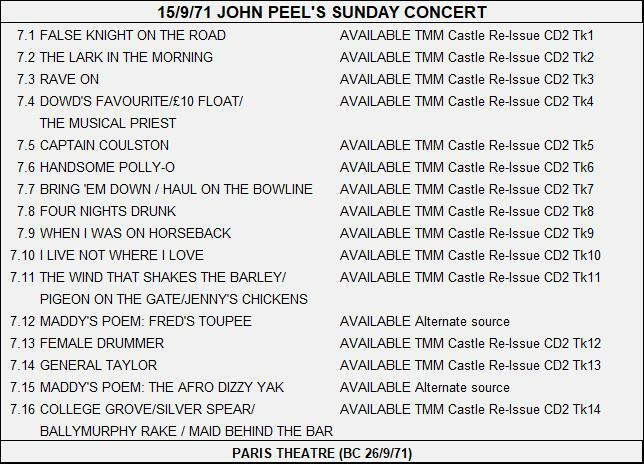 As sessions began for Ten Man Mop, this fantastic set was recorded for John Peel's weekly Sunday Concert. All tracks (omitting Maddy's 2 poems - a concert regular at the time) appear on Castle's Ten Man Mop re-issue, but can be found in pristine quality elsewhere. Tracks as yet unheard from the new LP are mixed with songs from Martin and Tim & Maddy's solo repertoires; 7.6 was recorded for 1972's Shearwater and 7.10 had appeared on Tim & Maddy's recently released Summer Solstice LP. This is an acoustic session as Pete was ill, so Lark is not sung by Maddy, but is the fiddle tune played by Martin in his own inimitable style. All preserved off air except, frustratingly, 8.2 fades up; so whether Long Lankin was acapella as per Martin's version on his 1968 But Two Came By LP is not known (my guess is that it was). I'm sure it did not resemble the version we all know and love from 1975's Commoner's Crown. 8.3 is actually We Poor Labouring Men, using the the same tune later used for Now We Are Six's Seven Hundred Elves. It was part of the band's live set at this period as was 8.5. 8.4 had been included previously on Tim & Maddy's Folk Songs of Old England Vol. 1 LP. The Castle/Sanctuary re-issues of 2006 do not include this session at all. With the departure of Martin and Ashley, the availability of BBC session material starts to become fragmentary. The new line up with Rick and Bob, had been rehearsing since December 1971 with songs largely lifted from Tim and Maddy's repertoire, and here are the first recorded fruits of that labour. 9.2 Ups And Downs was seemingly developed by Bob, but not recorded officially until a year later. The repeated vocal intro is the same arrangement as was played live at this time. Additionally, a new set of reels (9.1) courtesy of Pete, also played as part of their concert set at this time, is included. A frustratingly incomplete session, and one which is not easy to attribute; the Playhouse was often used for live recordings…(although not necessarily - see Bowie's 25/03/1970 session). It is the only session appearance of 9.1 which has influenced my decision to place it here. Further new material used for the Below The Salt LP, except The Gamekeeper (assumed to be Bold Poachers) which was reserved for Parcel Of Rogues a year later. 10.1 is The Bride's Favourite/Tansey's Fancy from Below The Salt with an extra coda, 10.3 has an extra verse and 10.2 - a long standing concert pleaser - is more dulcimer driven, with no 'staccato' electric guitar (sorry, I don't know the technical term!). As recording for the new LP got underway, this BBC session included more material from it. 11.2 Dancing At Whitsun - complete with Pete’s mandolin flourishes - came from Tim & Maddy’s 1971 Summer Solstice LP. 11.4 is once again, The Bride's Favourite/Tansey's Fancy. Although being sung live at this time, this is the first occasion a studio recording of the now well-known Gaudete was heard. There are two instances of this song in the session material and it has been difficult to decide which belongs where. The version to be found on the Rarities & Verities Bootleg may also be the one on BBC Transcription Disc No 478, but confirmation is needed. A session including Frankie Valli's Rag Doll not recorded until a year later on the group’s April/May US Tour, and another two songs from Tim and Maddy’s repertoire; 12.3 False Knight On The Road (slower without any of the overdubs found on Summer Solstice) and 12.4 Saucy Sailor (shorter, with less of the piano improv at the end). Also included is the newly developed Cam Ye…. for the Kidnapped play – rehearsals looming in 2 weeks - with a mandolin arrangement and vocals by Maddy and Bob. Some sources also quote an extra song 'Black & White Rag' as part of this session, but it has not surfaced. NOTE: although usually John Peel, the Friday show was presented this week by Bob Harris. Recorded in the same month as the release of Below The Salt, this sadly missing Kidnapped-material session includes the Bonnie Prince Charlie propaganda song Bonny Moorhen (recorded for, but left off Parcel Of Rogues) and the 'hilarious vocal' of Jacobite Rock sung by Rick. Additionally, 13.3 is an early version of the title track of the 1973 LP. And Aitken Prawn? No idea. There was a contemporary BBC engineer called Bob Aitken, and my guess it is a 'tune' with an improvised title. The most frustrating 'black hole' of the BBC sessions. Another missing one. Sounds On Sunday - 'Contemporary Folk with Johnny Moran'. Assumed to be a live session (these are all songs played in concert at the time) - recorded at the Playhouse Theatre. A session of songs played on the newly begun Below The Salt Autumn Tour. Gaudete is sung with a slightly different inflection that was used at the time and may be the version found on BBC Transcription Disc No 478 (see above) but confirmation is needed. The Weaver, not released until next year’s Parcel Of Rogues LP, has strummed guitar on the intro and lengthened acapella lines at the end. 15.3 is the old Country song and is to be found on Transcription Disc No 478. Bob usually sang this in live performance. More songs used at the time on the Below The Salt Autumn Tour. General Taylor (16.2) an early outtake is here sung - uniquely - by the Mk3 line up. 16.1 is a more 'electric' sounding version of John Barleycorn and 16.3 includes the short additional coda to Sheepcrook And Blackdog mirroring the contemporary live arrangement. 16.4 appeared later on the Parcel Of Rogues LP in a shorter version as the punningly-titled 'Robbery With Violins' (also above). An acoustic feel is applied to these songs, recorded at the same time as sessions for the Parcel Of Rogues LP. All these songs were included in the Fanfare for Europe concert at the Royal Albert Hall the previous day, however only One Misty Moisty Morning (yet to receive its chiming guitar introduction) was destined to appear on the next LP. Ricky Nelson's Hello Mary Lou (17.1) is otherwise unreleased and Three Drunken Maidens (17.3) was previously on Tim & Maddy's 1971 LP Summer Solstice. Uniquely, a brief clip of the band recording 17.1 along with interviews from John Peel and others, was included in the 'Radio Wonderful' promo film from 1973 or 74. Appears to be one of the few sessions retained by the BBC. As recording sessions for Parcel Of Rogues continued, another selection of songs which would appear on the LP, except for the mysterious Lots Is A Bun Dance (lots is (an) abundance) - another appearance of 'The Bride's Favourite/Tansey's Fancy' but played with a more improvised feel. Ken Garner's session notes lists it as the last song, but off-air recordings reveal the order as above. Possibly another one of the few sessions retained by the BBC. Another assumed live session recorded at the Paris Theatre, the last one before the addition of drummer Nigel Pegrum (?) Speakeasy was presented by Jimmy Saville until it ended in September 1973. Recording sessions for Now We are Six had been started in October 1973, but completed by the time of this session. Thomas the Rhymer was released as a single a week prior to this recording and this version mirrors that shorter arrangement. Edwin (20.2) is powerfully sung by Rick, without the flute overdubs found on the LP. Nigel Pegrum's first BBC session. All songs to be found on BBC Transcription Disc No 488. Includes three songs not officially recorded by the group. Summer is A-Coming in and Staines Morris were introduced into the live set in May 1974 forming, along with (In) Peascod Time, a 'pastoral interlude'. Lyke Wake Dirge (21.3) was first used as a concert opener in June 1973 to dramatic effect. It was revived a year later for the BBC Electric Folk TV episode from Rivington Hall Barn. Summer Is A Coming in had been heard in 1973's visit to Penshurst Place. One of the few sessions surviving in the BBC archives, this was re-broadcast (except Summer) in 2014 on BBC 6's Marc Riley show and (partly) again in 2018 both in superb (though slightly compressed) quality. Thought to be recorded early May. All songs (except 22.3) are from the group's Back In Line album released in May. The Blacksmith was introduced as The Blacksmith Mk3, as Maddy noted it had been sung by both the initial 2 line ups of the band, but not this one with Peter and Rick. Included for completeness - this session needs additional information please! All information contained on this page has been collated through the research of Chris Haines and should not be reproduced in whole or in part without his express permission.